The absurdity of Rand Paul's quest to audit the Fed: If he succeeds, it will probably backfire on him. This man would like more influence over our monetary policy. Rand Paul is quickly turning his absurd crusade to audit the Federal Reserve into a mainstream conservative cause célèbre—enough so that today, during her testimony before the Senate, Janet Yellen herself weighed in. (Like just about every other Fed official who has addressed the issue, the central bank’s chair trashed the idea, saying it would “politicize monetary policy.”) Given the White House’s opposition to Paul’s legislation, it shouldn’t become law any time soon. But let’s say it did. What would happen? Ironically, it might just lead to higher inflation—which is supposedly the last thing the senator from Kentucky wants. That argument might be more convincing if Paul’s bill were focused just on conflicts of interest. But it’s not. In large part, it’s geared toward letting the Government Accountability Office “audit” the Fed’s monetary policy decision-making, one of the few areas of the central bank’s business it’s not allowed to assess. In plainer language, it gives the GAO the power to produce a lengthy report criticizing the central bank’s handling of interest rates, which might theoretically put political pressure on it to change its policy direction. In a small but meaningful way, it would chip away at the central bank’s independence. This is where the humor comes into play. 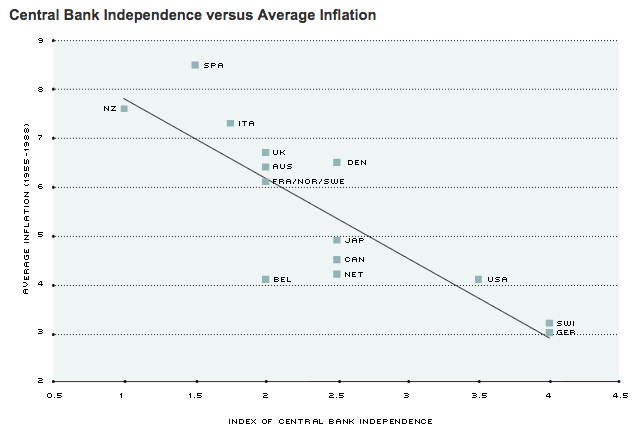 Politically independent central banks are better at fighting inflation. That has been the consensus ever since Larry Summers and Alberto Alesina published a famous paper on the subject in 1993. This is why inflation hawks like Dallas Fed President Richard Fisher oppose Paul’s audit bill as well. An extra GAO report here or there wouldn’t necessarily have a devastating impact on the Fed’s ability to function. But the audits would contribute to a slow chipping away of its independence. And that could set the stage for Paul’s worst, Weimar-themed nightmares to finally come true. *Update, Feb. 24, 2015: I originally referred to Paul as a “Cassandra” in this post. Turns out, I have been using that reference incorrectly up until now. According to Greek myth, Cassandra was given the gift of prophecy, but cursed so that nobody would believe her predictions, leaving her unable to change the events she could foresee. Rand Paul is in precisely the opposite position: Influential, but not very prophetic.